The 2016 Black Convocation will be held in Haines Hall on October 4, 2016. A reception will begin at 5:00pm in Haines 153. 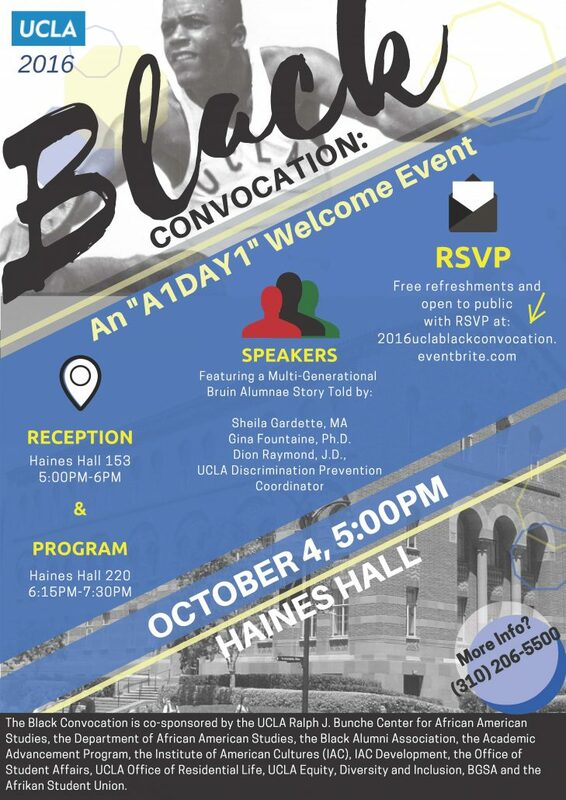 The convocation will immediately follow from 6:15pm to 7:30pm in Haines 220. The Black Convocation is co-sponsored by the Ralph J. Bunche Center for African American Studies; the Department of African American Studies; the Black Alumni Association, the Academic Advancement Program; the Institute of American Cultures (IAC); IAC Development; the Office of Student Affairs; and Residential Life. NOTES: In case we reach capacity in Haines 220, a simulcast of the program will be provided in Haines 135 & 153. Please remember to sign in at the check-in table when arriving. Parking ($8) is available (after 4:30pm) at the Pay Stations in Structure 2 (south entrance, levels 1 & 2) or Structure 3 (north entrance, levels 1-3). Enter the UCLA campus at Hilgard and Westholme avenues. The 2016 Hollywood Diversity Report: Busine$$ as Usual? DOWNLOAD HERE. HuffPost: What Do Barack Obama and Snapple Iced Tea Have in Common?